Visiting to the Lençois in the North of Brazil is not a typical thing to do even for Brazilians meaning this destination is still one of the most astonishingly beautiful and untouched areas of the country. Composed of sand dunes and surrounded by crystal clear water originating from heavy periods of rain during the rainy season I was lucky enough to visit last month (May 2012) as a Brazilnuts travel specialist. The tour to the Lençóis begins in the city of São Luis, the biggest city in the region with a population of about 1 million habitants. The city is known as the Brazilian capital of reggae and it has French, Dutch and Portuguese influences from the period of European colonization of the country. When you visit São Luis you should stay by the beach area or in the historical city center. By the beach the best hotels are the Pestana São Luis, located on Atlantica Avenue next to bars and restaurants; and the Luzeiro with its really big rooms and great service. Whilst in the historical city center the best ‘pousada’ is the Portas da Amazonia, very charming, boutique like, good price and location. Here is the list of the best hotels in São Luis. While in São Luis you should visit the historical city center: Casa do Maranhao (the Maranhao house museum), Museu Historico e Artistico do Maranhao (the Maranhao history and arts museum), Beco Catarina Mina (the 35 stairs from the 18th century). 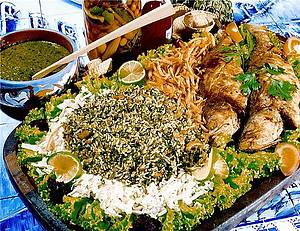 The local food of Maranhão is fish with ‘cuxá-rice’ – an African origin recipe of rice and herbs – and some of the best restaurants are Cabana do Sol (local food), A Varanda (sea food), Cheiro Verde (sea food) and Maracangalha (local food). When you go to visit the Lençóis Maranhenses Park you take a transfer of 3-4 hours to the town of Barreirinhas with a stop in a motorway restaurant for about 15 min, then on to your lodge or resort. Barreirinhas is a very small and poor town which is now developing due to the tourism to the Park , so when you visit there, make sure to choose the right resort (click here to see the list of resorts in the area) as this is basically where you will be around. in the sand (paid separately): get somebody to drive you around or drive yourself. After 2 – 3 days in the Lençóis you get back to São Luis – take a late transfer at around 02:00pm direct to your flight or hotel. Adventurers might stay in the Lençõis and join the ‘route of emotions’ going down South to the Delta river and then Jericoacora. This entry was posted in São Luís Maranhão and tagged Hotels in Sao Luis and Lencois Maranhenses, Lencois Maranhenses Park, Lencois Maranhenses Travel, Sao Luis, Travel to Lencois Maranhenses. Bookmark the permalink.